Local History/Special Collections houses many resources for those interested in Alexandria and Virginia history and genealogy and the Civil War. Major activities include generating online exhibits, collection guides and genealogy indexes. Alexandria and Northern Virginia resources include: compilations of birth, death and marriage records; church and cemetery information; microfilm copies of the Alexandria Gazette, the local newspaper; information about local archaeological projects; microfilm copies of legal records such as wills and deeds; information about historic Alexandria houses; biographical information about prominent local people and families; general histories of the area. The collection is strongest for Virginia families, but more general resources are available as well. An in-depth guide to the collection's genealogy resources is also available. Materials include: indexes and compilations of vital statistics for Virginia counties and limited material about neighboring states; microfilm of the federal census for all the Virginia counties; dozens of genealogical journals. History of all aspects of the conflict, with a focus on the Confederacy. Resources include: Virginia regimental histories; War of the Rebellion Official Record (the "OR"), which reproduces government documents dealing with the war; information about Alexandria during the war. The library has several collections of photographs that depict life in and around Alexandria from the time of the Civil War to the present. Photocopies of the images are arranged by subject, and digital and photographic reproductions of prints are available for a fee. The collections cover Alexandria people, events, houses and other well-known places. The Historic Alexandria Imaged Database is a sampling from our several collections of materials related to the historic structures in Old Town Alexandria, Virginia. In addition to the census records and the Alexandria Gazette, the collection contains: microfilm of other local newspapers; deed books, will books and other local land records; maps of the local area; copies of several manuscript collections. A subject index of the microfilm collection is available both at the library and online. The library holds the personal and business papers of many Alexandria individuals and institutions, including the records of some local private schools, businesses, and people. There is a subject index to the collections in-house as well as online, and detailed finding aids exist for many collections as well. The core of the rare book collection is the original collection of the Alexandria Library Company, which was begun in the 1790s. This collection is representative of the types of books that could be found in a subscription library from that time period. Most of the maps in the collection cover Virginia, with emphasis on the Alexandria region. Most maps are available for perusal in their original print form, while others, like the detailed Sanborn Fire Insurance maps, can be found on microfilm as well. The map collection is indexed by subject, and the index is available online and in the library. Special Collections subscribes to many journals that discuss history, genealogy and historic preservation. Twenty-three of those periodicals are indexed and available online. The Alexandria Library Company was founded on July 24, 1794, at John Wise's house. A week later the members met in Wise's long room -- upstairs in the smaller section of today's Gadsby's Tavern -- to elect officers. The Reverend James Muir was elected president, Samuel Craig, treasurer, and Edward Stabler, librarian. On January 9, 1799, the Alexandria Library Company was chartered by the General Assembly of Virginia. To see the library's timeline click here. 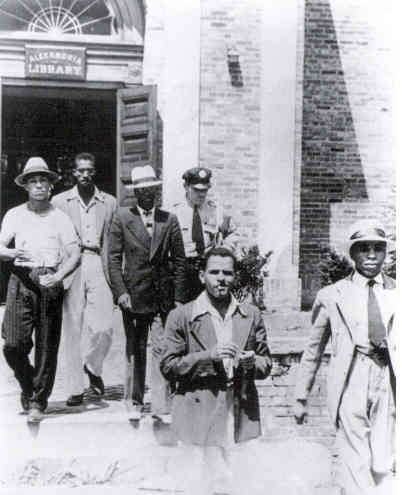 One of the nation’s earliest known civil rights sit-in involved leadership from native Alexandrian, attorney Samuel W. Tucker, and five young African American men who demonstrated an act of civil disobedience at the Barrett Branch after being denied library cards. The Library sells a select list of books related to Virginia and Alexandria history and genealogy. Orders are accepted by mail with payment by check or money order. Please print the price list/order form. The Alexandria Library spent most of the 1990s on a building boom. A new central (main) library was constructed on Duke Street opposite the former site of Cameron Station, now a residential area. The Barrett Branch on Queen Street, shed of its "main library" space requirements, had room to house the history and genealogy collections formerly in Lloyd House. Local History and Special Collections moved to Barrett Branch in May 2000. In addition, the Barrett Library serves as a downtown branch with full public library service including services to children. Our last two years in Lloyd House were difficult. Shelving space was non-existent and we had to triple layer the books on the windowsills to store the collection. An architectural engineering study revealed stability issues and we had to pack over 4,000 books (about 25% of the collection) to off-site storage with no access and discontinue use of a lot of shelving because the floor was not safe for the 150 pounds/square foot floor loading requirement for a library even though we knew at that point that we'd be leaving the building. After vacating Lloyd House, the building was closed for about three years for extensive renovation that included shoring up the floor and ceiling joists that affected the use by the Library. Space was opened up on the first floor on the north side and a catering kitchen and restroom were added on that level. At this time Lloyd House is the headquarters for the Office of Historic Alexandria, the city agency responsible for the museums, Archaeology, etc. So, it is in use as light office space. The public spaces on the first floor and the backyard garden are used as rentals for social functions. The Alexandria Library moved its historical and genealogical collections to the Lloyd House in 1976 because the collection outgrew the space it had in the Barrett Library. By 2000, we had clearly outgrown Lloyd House and there was plenty to be had (more space, increased service hours to include evenings, and modern conveniences) with a return to the Barrett Library.